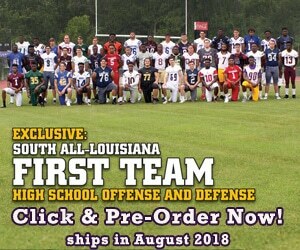 St. Charles Catholic High School Kicker Andrew Rodrigue may not get the attention of some other kickers in the state like Mandeville Kicker Joseph Bulovas but he can still get the job done as he only missed one field goal last year. Central High School Cornerback Jearlmiah Ward is one of the most undervalued cornerbacks in the state. As of right now, he has no offers but he should be getting a lot more. Jearlmiah is a solid cornerback who has great cover skills and can lock down an opponent's number one receiver. Arcadia Center/Defensive end/Defensive tackle/Long Snapper/Full Back Dustin Mills is one of the most versatile players in the state with the many positions that he can play. Proving his versatility even more, he is playing a new position at tight end. Just call him a Swiss army knife as he does everything on the football field except playing quarterback but who knows he might add that to his list of positions that he plays soon. St. Amant High School QB Hayden Mallory is one of the most underrated QB's in the entire state. He plays against some pretty tough competition and he has a very strong arm maybe the strongest in the state but if you don't take my word for it, then take Lee Brecheen's take on the senior quarterback. Linebacker Ken Jones from Westminister Christian Academy can be one of the state's major sleepers for this year. He not only plays linebacker but he also plays FB, QB, and RB proving that he is very versatile but as a linebacker, Ken has the chance to become a very good D-1 player. Check out our interview with OL/DL Rendon Miles-Character who plays for St. Augustine High School and plays both ways. He made All District in his first year as a starter and he did against some of the toughest competition in the state.